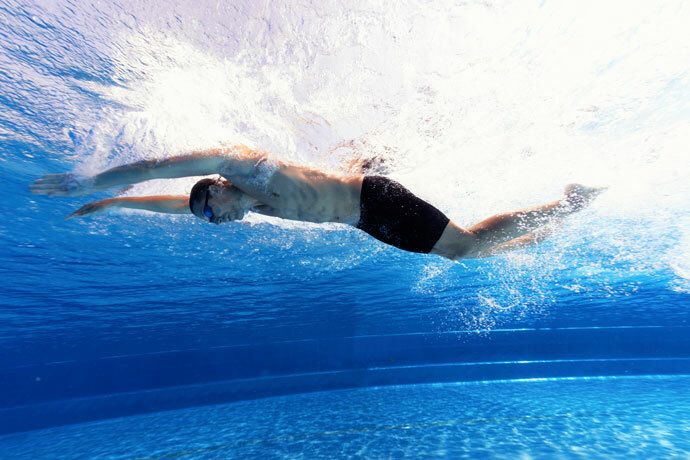 In the butterfly stroke, swimmers execute a technique with their legs called the dolphin kick. In the dolphin kick, both legs do a simultaneous whipping movement, with the feet pointed. This looks a bit like the up and down movements of a dolphin’s tail, which explains the name of this swimming technique. What is noticeable among others in his technique is his snake-like body undulation and the extreme flexibility of his ankles. The movements of the legs are rather simple. However, it takes practice to connect them with the undulation of the body, which is at the heart of the butterfly stroke. This undulation is initiated by the head and chest, travels down the torso, hips and then into the legs, where it ends with a dolphin kick. You are floating in a horizontal position in the water and on your chest. Your head is in line with your torso. Your arms are either extended forward or at your sides. Your legs are close together, and your feet are pointed. 1) Push your chest a few inches downwards in the water, then release it. 2) As you release your chest, push your hips down in the water, then release them. 3) As your hips drive downward, let your thighs follow behind in the downward movement, your legs bend slightly at the knees. 4) Then, as your hips move upward, straighten your legs to execute a whipping movement. 5) Then let your upper legs follow along with the hips upward. 6) Start the next cycle. Press your hips downward again. Your legs will follow along with some inertia, and your knees will bend slightly again during the downward movement of the hips. As discussed above, both legs move synchronously in butterfly, unlike in front crawl or backstroke for example. During the downbeat, you should keep your feet pointed to properly execute the whipping movement. Then, when your lower legs move back upward, you relax your feet. The water pressure will cause them to move into a neutral half-extended position. The propulsive phase of the kick occurs during the downbeat, when your feet are pointed, and you straighten your legs. During that phase, there’s a short amount of time where the tops of your feet are facing backward. Because you are moving your feet downward, water will then be pushed backward and provide propulsion. The more flexible your ankles are, the better the propulsion of your feet is as you can keep the top of your feet facing backward for a more extended amount of time. So Michael Phelps’ flexible ankles are a clear advantage. 1) The downbeat of the first kick occurs during the entry of the arms in the water and their extension forward. 2) The upbeat of the first kick occurs during the insweep of the arms towards the chest. 3) The downbeat of the second kick occurs during the outsweep and upsweep of the arms. 4) The upbeat of the second kick occurs during the release of the arms from the water and their recovery forward. This upbeat helps to move the head and shoulders above the water surface. 1) If you have particularly stiff ankles, the regular practice of ankle stretching exercises and the use of short swim fins while swimming can help loosen up your ankles and improve your propulsion. 2) Please also have a look at our swimming drills to learn the dolphin kick. What happens when you separate your legs during the dolphin kick? I think there will be less propulsion because you have less grip on the water. What is downbeat and upbeat for dolphin kick?